It is said Einstein did not know his own phone number. Not because he wasn’t an intelligent man, but because he did not want to clutter up his valuable grey matter with information he could easily look up when needed. The vast majority of us today do not know any phone numbers. Not because we are all budding Einsteins, but because we have become victims of learned helplessness due to smartphone functionality that enables us to call others by simply clicking on their name or picture in our digital address book. Today we inhabit a digitally pervasive web of networks that afford us unprecedented access to information. For example, I just asked my Artificial Intelligence (AI) gadget, Alexa, to read the definition of learning on Wikipedia. She promptly responded, “Learning is the act of acquiring new, or modifying and reinforcing existing, knowledge, behavior, skills, values, or preferences, which may lead to a potential change in synthesizing information, depth of knowledge, attitude, or behavior.” She could have gone on to read the rest of the page, but that was enough for me. Like a cat, curiosity got the better of me once more. “Alexa, Wikipedia, Generative Learning.” Same result. “Learning is the act of….” To which I responded “Alexa, Shut Up.” The Law of Diminishing Astonishment had already set in with my new AI toy. As our lives become increasingly digitally mediated, the distinction between productive and generative learning becomes crucially important. Productive learning is about conveying known information to achieve a specific outcome such as increasing customer satisfaction, improving productivity, or knowing whether or not to bring a raincoat to work tomorrow. In short, productive learning is about helping people find out something that is already known. Generative learning, on the other hand, is about figuring out something we do not yet understand. 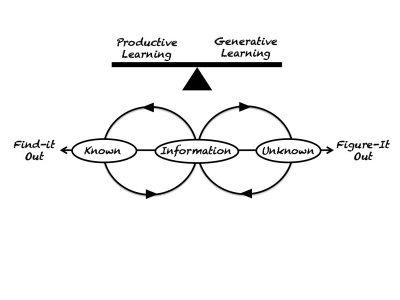 Productive learning serves largely to maintain the status quo by conveying what is known, while generative learning involves not only absorbing known information but also generating new information while addressing unanticipated opportunities or challenges. In economic terms, productive learning focuses on efficiency and productivity, while generative learning focuses on innovation and growth. One of the primary issues we face as Learning professionals is that we are applying radically new technologies to advance productive learning through AI and digitally mediated classroom instruction at the expense of generative learning. Learning professionals need to focus on leveraging these new technologies to help people figure out new insights on how to address opportunities or threats. I challenge you to join me in figuring out the best way to do that.